Stylish bulk branded ladies umbrellas. This interesting and attractive umbrella for ladies is sure to impress in any kind of weather, be it sun or rain. Its large, multi-purpose design is ideal for protection against harmful UV rays, heavy rain and dust, and is constructed with high quality materials. 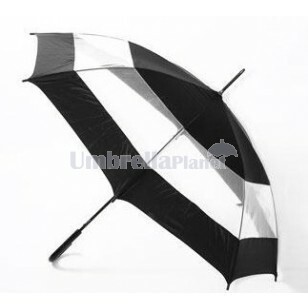 This is a very useful umbrella that can be used during all the seasons and for several purposes. Companies and institutions can gift one of these to all their women staff and students working or studying in their organizations with their brand name or brand logo imprinted on the umbrella that will help in promoting their business easily without having to shell out a lot of money for marketing and promotion. Pricing includes a single colour screen print of your logo on a panel. Full colour digital print is available for an additional $1.95 GST for each panel on the umbrella. A branding set up applies for an additional $60 per colour. When you order these promotional umbrellas in Australia, we will organise to have your bulk order delivered directly to your office in 10 working business days. Our prices do not include GST. For better handling and grip, the handle of these appealing umbrella is made with durable plastic that lasts long without breaking or causing any pain in the arm. The tips are coated in black plastic and can be carried easily wherever you go. The umbrella has a clear PVC window stitched in the centre of each panel and is made with 190T nylon canopy and has 8 panels, and has 8 single ribs that are made with black electroplated steel shaft.